For the majority of my life I didn't know what I wanted to do. I've always been drawn towards film and in more recent years towards theatre, but I was never one of those kids that from the age of 3 knew exactly what I wanted to do. It seems like the majority of people you talk to or read about online knew since they were a toddler exactly what they wanted to do. And for someone who never had a clue, it was a bit worrying to be graduation high school with no idea of where they want their life to go. So if you can relate, know that you're not alone. 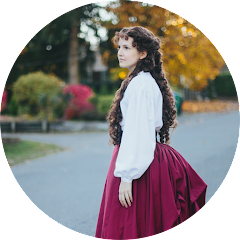 I've been doing some re-branding with my costuming on the web lately, and while I was updating my blog I had the idea to add a page titled "My Story" with... Well, my story. After I finished it I thought it would make a good blog post, hence this post. Growing up I didn't have any idea what I wanted to do for a career. 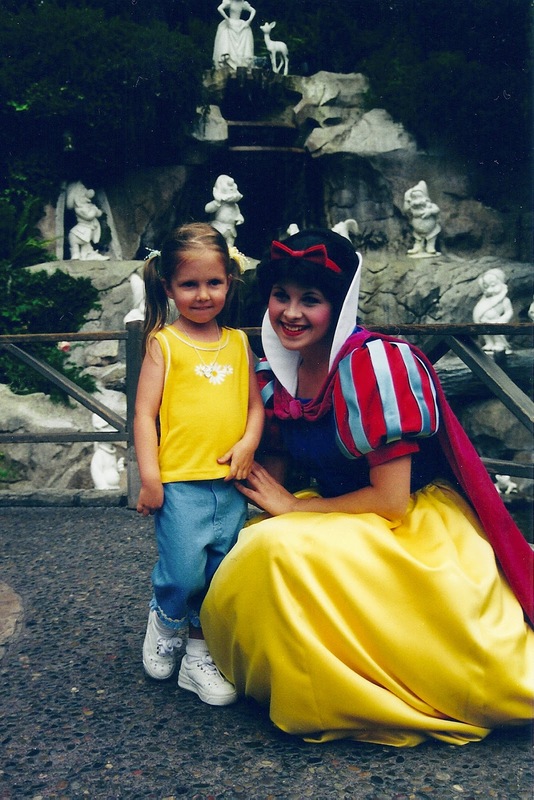 When I was 6 I wanted to work as Snow White at Disneyland and when I was older I wanted to be Indiana Jones... Er, an archaeologist. But I decided that archaeology wasn't exciting enough in the real world and continued life without having a clue, or really caring much. Life continued and I started making short films with my sisters and brother, which eventually lead to making a few with friends, which lead to, well, no where actually. I was drawn towards the costumes, especially when we made a film about a princess's coronation in a fantasy land. There was fancy dresses, a murderous plot, and terrible acting. This video remains safely hidden on YouTube where no one can ever see it. Thank goodness. You would think I would start to get a clue around this time that I was drawn to costumes. But no. I knew I was interested in film making in general, but that was it. Then in 2010 (or maybe 2011, or was it 2009? I honestly don't remember) I saw a friend's costumes that she had put together at a homeschool fair and I had a total "ah-HA!" moment. I remember thinking to myself "that's what I want to do. I want to make costumes!" At the time I had absolutely no sewing experience, so I asked my mom to teach me. She pulled out the old sewing machine, which was probably from the 70's from the yellow plastic and ancient looking design. My mom taught me what she knew, which was only the sewing basics and I started making all kinds of small projects - bags, pillows, and clothes for my stuffed animals. Eventually I became bored with these trivial projects and I decided that I wanted to make a dress. I decided a nightgown would be the perfect first "real" project for me, so my mom and I went to the fabric store together and picked out a Simplicity pattern, which should have been simple enough, but would soon drive us nuts. I never finished the nightgown and there were several moments when I wanted to run away screaming because the pattern just didn't make sense. I still don't like working with commercial patterns to this day and it's largely because of this project (thanks Simplicity). Well, fast forward three pillows, six bags, and a whole stuffed animal wardrobe to May 1st 2012 when I decided I wanted to celebrate May the 4th (Be with You) - AKA Star Wars Day - by making a costume. I had found a lovely tutorial/walk through someone made for Leia's senatorial gown from A New Hope and decided to give it a shot. My mom and I made a quick mock up (my first mock up - yay!) out of some old tan sheets and went shopping the next day for materials. We searched all over for a suitable fabric, but since neither of us had any clue about fabric types and had a budget the size of a grain of sand we ended up buying some white sheets. For our first real project and making it in 3 days, it actually turned out fairly good. All things considered. I mean, it was easily recognizable as Leia. So that counts as a win, right? And that, my friends, was my first ever costume. I continued sewing and continued creating my own patterns vs. using a purchased pattern. I learned mostly just from trial and error for those first few years but as I progressed I started researching and reading more, both books and blogs to try and build my skill even further. 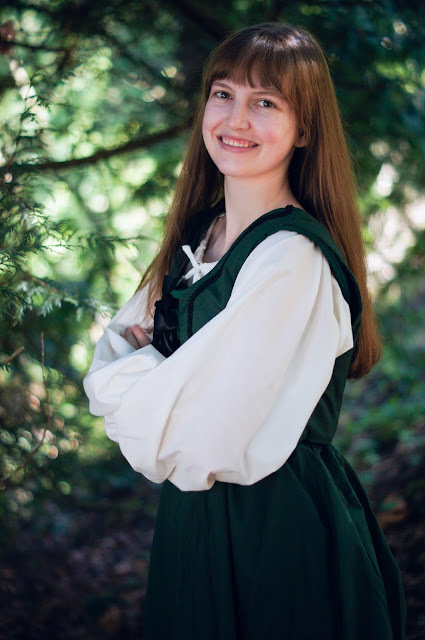 As I continued, costuming soon became something more than just a little hobby. I spend the majority of my time sewing, researching, thinking, dreaming... Okay, you get the point. Then in last year I was asked by a group of film makers known as Rogue Zohu (who happen to be the same film makers I made the princess/coronation/murder short I mentioned before with years ago. Needless to say, they improved much between then and 2016) to be Wardrobe Assistant for their short film Save Lives. Apologize. I quickly said yes. There may or may not have been some excited squeals that day. That project is one of my best memories and favorites because it was that weekend when I discovered that costuming was what I wanted to do with my life. For the first day of filming I was in charge of dressing 20+ extra's, which consisted of elementary aged children, in 70's clothing. It was chaotic, exhausting, a little stressful (thank goodness for our amazing AD! I would have been lost without her), but mostly fun. Okay, all fun. After that first day of shooting and on the way back to our home for the weekend (we were staying at a friends house for the shoot) I just knew that that was what I wanted to do. There was no doubt. Since then I've been digging further into costuming. How about you? Have you always known what you wanted to do? Or are you like me and have/had no idea?